This is the place to learn about the exciting field of nanotechnology. This site has lots of intersting information on nanotechnology, to help you with school work or to just to your curiosity. 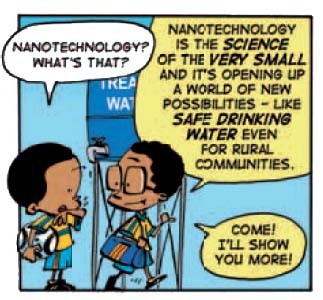 Check out Nanooze, our nanotechnology magazine for kids. Interesting articles and cool pictures. Looking for a nanotechnology science fair project. Wow them at your science fair. We have some ideas!